News broke a couple of weeks ago that Utah State received a commitment from a JC power forward Sean Harris. Now, I know you may be thinking: “The Aggies recruit LDS missionaries? I thought that was just BYU!! ?” but before you get too far, the image to the left may not be what you think it is. After completing one year of Junior College at Yuba College in California, Harris left to Honduras on an religious mission. While on his mission he committed to Bradley University (thus the photo to the left). However, shortly thereafter, coach Jim Les was released from his duties as Bradley’s head coach, and Harris decided to re-open his recruitment. 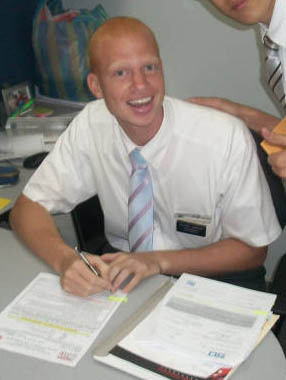 As a member of the Church of Jesus Christ of Latter Day Saints, Harris grew up a BYU fan, and was very interested in playing in the state of Utah. Upon returning home from his mission, Harris was recruited by both BYU and Utah State, as well as several other D1 schools including Idaho, UC Santa Barbara, and UC Davis. After taking an official visit to Utah State to take in the Utah State vs. Weber State football game on September 10th, Harris decided to look no further, and committed to the Aggies. Sean graduated from Rocklin High School in Rocklin, CA as a 6-6 forward. He was named the team MVP his senior year averaging 16.6 points, 8.6 rebounds, 2.6 steals and 2 blocks per game. He then moved to Yuba College leading his team to a 32-4 record while averaging 14.9 points and 11.7 rebounds per game. Harris was once again named team MVP, and was the runner up Bay Valley Conference Player of the Year as a freshman. Since then, Harris has grown a couple of inches and is now listed at 6-8, 200lbs. Sean hasn’t played in three years but is an extremely hardworking kid with a high motor. I call him a skilled four, someone skilled and strong who really runs the court. He has put on 15-20 pounds of muscle and is going to be a really hard matchup but first he needs to get his legs back. With Brady Jardine graduating after this year a lot of playing time will become available down low for the 2012-13 season. It appears that Sean will be competing for time in the post with highly touted Oklahoma State transfer Jarred Shaw, Ben Clifford, Kyisean Reed, Igor Premasunac, and likely redshirt freshman Jordan Stone, none of which have yet to play a minute in an Aggie uniform. Shaw, Premasunac, and Stone will play more of a true center position while Clifford and Reed will most likely be Harris’s main competition for playing time at the power forward slot. It should be very interesting to see how it all shakes out next season. By this time next year, things will likely be much more clearly defined. After a long bye week it’s time for some Aggie Football this weekend! The Bull Sheet / Refraction staff have treated us with another edition of The Bull Sheet, Romney Stadium’s Premier Belligerent Game-Day Newsletter. This Colorado State Edition includes a review of the WAC performances thus far, a look ahead to our contest against BYU in Provo next weekend and a recap on their EPIC FAIL this past week, Good Dave / Bad Dave (Baldwin) revisited, and as always a scouting report on the Rams. Check it out! If you like what you see please use the “Donate” link to contribute to printing costs. The Bull Sheet / Refraction crew have to pay out of their own pocket to print this thing. Any donations are greatly appreciated. It’s that time of year again folks! Time for some Aggie Football on Merlin Olsen Field at Romney Stadium! The Bull Sheet / Refraction staff have officially kicked off the season with this week’s edition of The Bull Sheet, Romney Stadium’s Premier Belligerent Game-Day Newsletter. This Weber State Edition revisits our oh-so-close epic upset at Auburn, Dave Baldwin’s offensive schemes, Chuckie Keeton, a scouting report on the Wildcats and more. Check it out! Romney Stadium’s Premier Belligerent Game-Day Newsletter, The Bull Sheet has returned for its third season this year. Check out the season preview which is geared to help the freshman understand the ways of Aggie fandom. The issue has details on how to do things at the games, when and where the Aggie Stampede will begin (a student march through campus to round people up for the game) and some details on a few of USU’s key players to give the newbies something and somebody to look for on the field and get attached to. Yet another former Aggie will be continuing his basketball career after graduating from Utah State. Former WAC Defensive Player of the Year Pooh Williams recently announced via facebook that he will be playing in the NBA D-League this fall. It is not yet known which squad Pooh will be on, but he will apparently find out on November 1st. A four-year starter for Utah State, Pooh ranks #4 all-time in career games played behind only Tai Wesley, Tyler Newbold, and Jaycee Carroll. 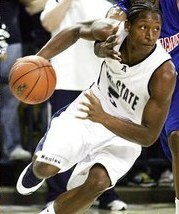 Pooh was well known at Utah State for his defensive prowess and athleticism. He was routinely assigned with the task of shutting down the opposing team’s biggest offensive threat, and more often than not succeeded in doing so. Pooh will also be remembered for his high flying dunks, whether they be in traffic, on the back door alley-oop play, or on the fast break. Throughout his career Pooh also developed a very good outside shot and ranks #8 all-time in 3-point field goals made. Pooh also became a clutch performer often taking over games down the stretch and hitting clutch free throws. Pooh’s passing ability was also a strength and he ranks #24 all-time in career assists with 242. Good Luck Pooh! And keep up the good work!